Santa had been very nice to me, I guess I was a good girl. I was the lucky girl to receive these stunning additions to my stash recently. Yarns from The Painted Tiger and Manos Handspun. These were from Swap Buddies in the United States, and I look forward to knitting them this year still. Hartlam Wander the Moors and Distant Hills. Hartlam Yarns is South African. The Distant Hills contains silk and wool. I have already chosen a pattern for the Wander the Moors. I started my Nurmilintu Shawl. It is such a stunning shawl pattern, I am loving it. My daughter found this really cute yarn, she asked for a wrap to keep at the office, as they have open plan offices and the AC can be a bit chilly at times. The yarn colour is so aptly named “Budgie”. It looks just like a cute little bird. I have started on it, and the progress is fast. It will be finished in no-time. 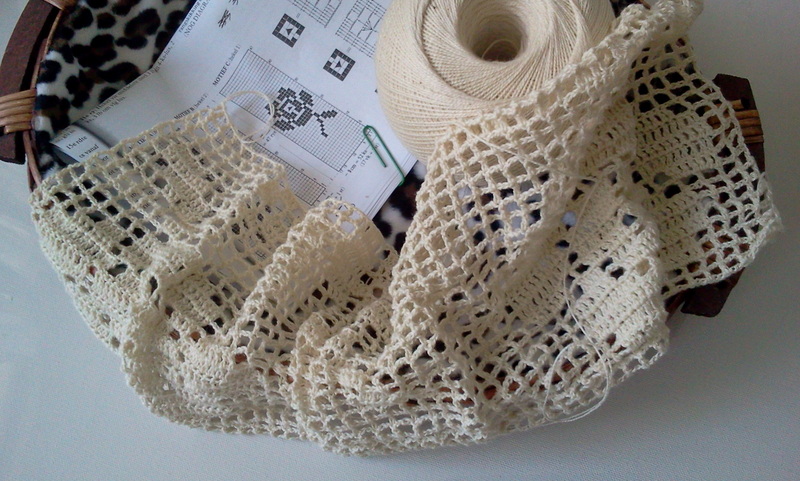 And here is the progress on my Filet Crochet. I must admit that I have not crocheted on it a lot. It is very fine work, and not something I can do at night, nor while watching television series or a movie. Even though it is very easy, it had been sitting in the basket for long periods of time. Japanese Love!! That is how I feel today. I collected my swap package yesterday, all the way from JAPAN!! I absolutely love all the stunning gifts and goodies. Yarn (and Kool-Aid, to dye with), chocolates, tea drinks, postcards, washi tape, toho beads, a tiny little crochet pincushion, notelets in a little tin and a stunning towel with a typical Japanese design. The circle shapes on the towel means Harmony, and it regarded as a very lucky pattern in Japan. The cloth is called “Sippo” with means Seven Treasures. This sure is a treasure to me as well. I immediately put the little tin and notelets on my desk at home. They are so cute and will be very handy. I follow “My Sister’s Knitter” and am always inspired by her stunning knitting and gorgeous projects. 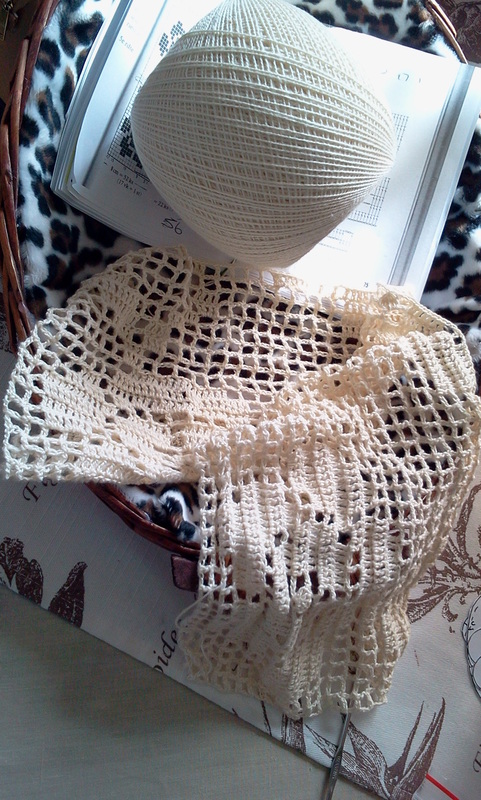 One of the recent items I noticed on her Flickr page was the Nurmilintu Shawl by Heidi Alander. I immediately, totally and utterly loved it. I got the pattern on Ravelry, and did some stash diving on the weekend. I could not wait to get started, and have already caked my yarn, it is Coral by Nurturing Fibres. Since I started doing more crochet work, I have done little bits here and there. After making a lampshade cover during the holidays for one of the lamps at home, I modified another lampshade with crochet lace and beads as well. And this top needed modification. I bought it, and after the first wash, it shrunk. I loved it to much to put if away, and after some research, I decided that a small lace panel on both sides and the bottom would be sufficient. I found the perfect cotton, and crocheted some lace panels. Now the top is perfect again. And I still have a few months of summer to wear it and show it off. My Spring Shawlette knit it finished, blocked, dried and ready to wing its way across the continent and oceans, all the way to my buddy. Cannot wait for her to get her package and tell me what she thinks. I have made such good progress on the Spring Shawlette that I am knitting for a swap buddy. The lacey edge is super easy and knits fast. I have already knitted quite a bit on the short rows, and only have another ten rows or so to complete.